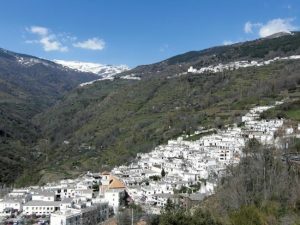 The custom of hitch hiking is common in Orgiva, so I tried my luck at cadging a lift high up to the mountain village of Capiliera, the furthest of three “Poqueira” villages. I didn’t have to wait long but the lift only went to the first of the three villages, Pampaniera. This meant that I had to walk up through all the villages before I even started the walk I wanted to do which was out beyond Capiliera to an abandoned village. When I finally go there I saw a very strange thing. I had no idea crouching on the ground with my camera just centimetres from this astonishing sight, that I was in real danger. These are Processional Caterpillars and when I showed someone a photograph of them days later, he was horrified that I had got so near to them. If this caterpillar is threatened it ejects harpoon like hairs that penetrate the skin and inject a powerful irritant. They are particularly dangerous to dogs who lick the hairs and transfer the irritant to their tongues which then swell and choke the animal. 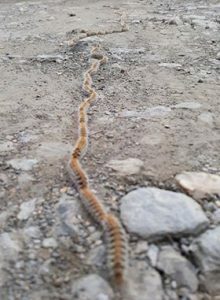 These caterpillars are real killers. – An acknowledgement that you need to nourish yourself. This is why we retreat from the world. – A need to trust and follow the urging of your heart, no matter what the danger, or no matter how many people want to stop you. – A revelation of who you truly are, a need to know yourself. In the stories, the hero or heroine sets out on a quest, often stealing away in the night or running from a wicked step mother. They see that something has to change, a wrong must be put right or something has to be freed. They make their epic journey and return as the revealed true Prince or Queen. In all these legends, one’s true nature is revealed: the frog or the beast are revealed to be a true heirs, the scullery maid or the sleeping girl return to take up their places as rulers of kingdoms. We tell these stories to our small children, little knowing we are planting a seed in them that could take root and flourish at times in their lives when they need to know a way forward in a difficult situation. Even if we don’t fully acknowledge the steps we are taking, we often follow this self determining, mythic pattern of releasing ourselves from difficult situations in relationships, jobs and events in our lives. I have been experiencing times of transition and change, times of great peace and prayer, times of sadness and turbulence. We all have these times in our lives and they are opportunities to shine a light into who we are becoming. They are times of challenge to stop trying to be someone else, to look for answers outside of ourselves, or idols to emulate. We must evolve into the unique people we were created to be. We must find our own purpose, the thing we are uniquely called to do whether that is being kind to small furry things or steering nations. Whatever our purpose is, we need to do it with all our heart, dream it into existence and contribute to bringing life back into this dark, troubled world. The more single minded we are in our purpose, the better we fit into this world. I didn´t know who is Linda Richardson but now I know that she wrote these words.